Light represents a great risk to many artworks, including Japanese woodblock prints from the 18th and 19th centuries. This is because they were often made using plant-based dyes, which can fade when exposed to light. Many Japanese prints have faded dramatically since they were made. Look at the two copies of a woodblock print by the Japanese artist Utamaro below. The copies were identical when the prints were produced. Now, most of the colours in the print on the right have faded. 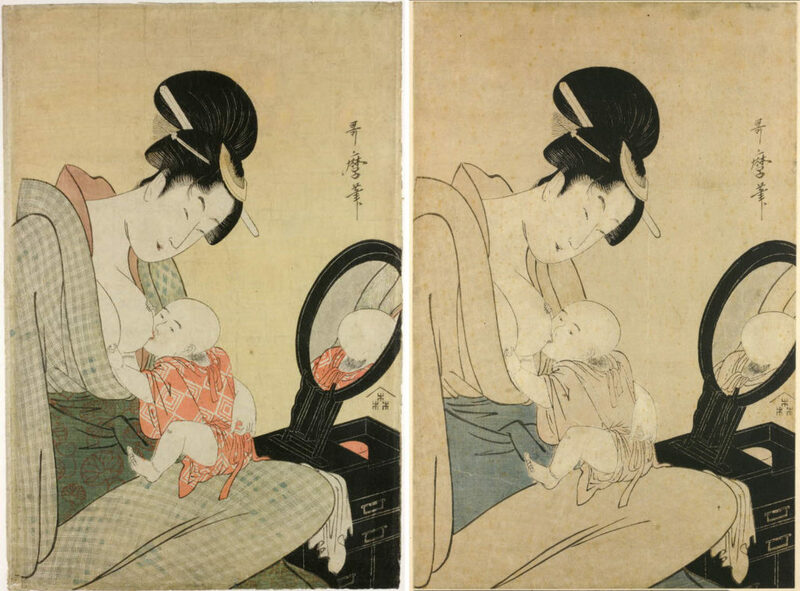 Kitagawa Utamaro, (1754–1806), two impressions of A mother feeding her infant in front of a mirror. Colour woodblock, c. 1797. Hokusai’s most iconic prints are ‘The Great Wave’ and ‘Red Fuji’ and the British Museum is fortunate to have impressions of both of them. 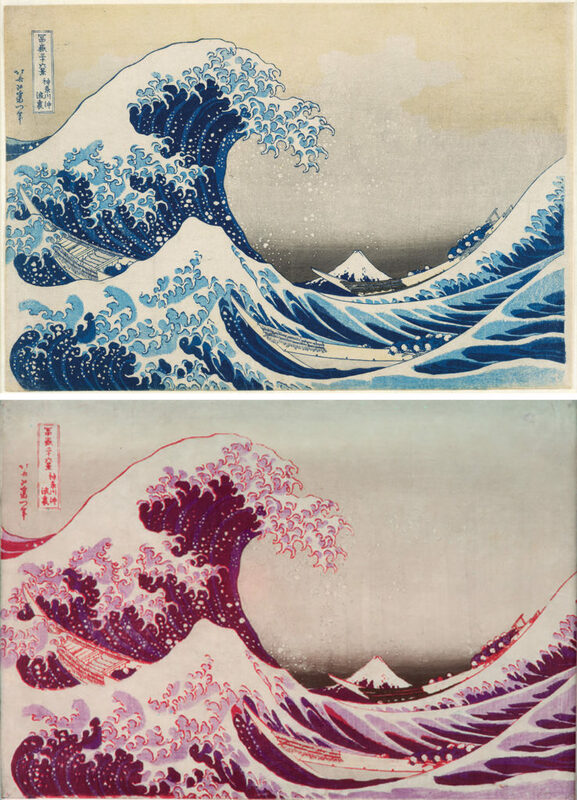 The inks used in these prints had never been scientifically analysed, so in preparation for the exhibition Hokusai: beyond the Great Wave, we decided to investigate how likely they are to fade, to make sure we can display them safely. Peter McElhinney, a PhD student from the University of Bradford, joined the Museum for a short period to work with me on these prints. 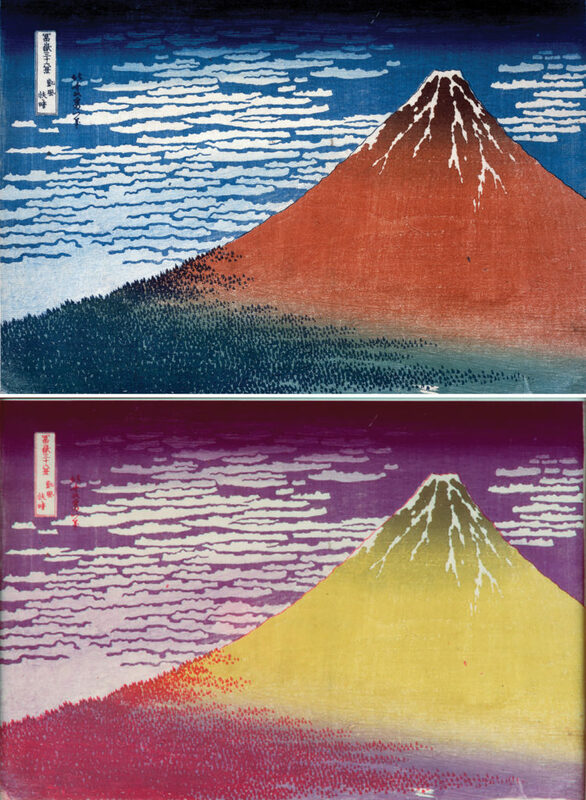 Together we analysed the colourants of ‘Red Fuji’ and ‘The Great Wave’ using two techniques: X-ray fluorescence (XRF) and multispectral imaging (MSI). These techniques are well suited to the study of museum objects as they do not damage the objects or require removing samples. XRF tells us which chemical elements are present in the inks, but not which compounds. For instance, if we detect the presence of lead in a pink paint, we need to do additional investigations to determine if the paint contains lead white (a white pigment containing lead) or red lead (a red pigment containing lead), or if it is a mixture of both pigments. XRF is also unable to detect lighter chemical elements, such as carbon or oxygen. 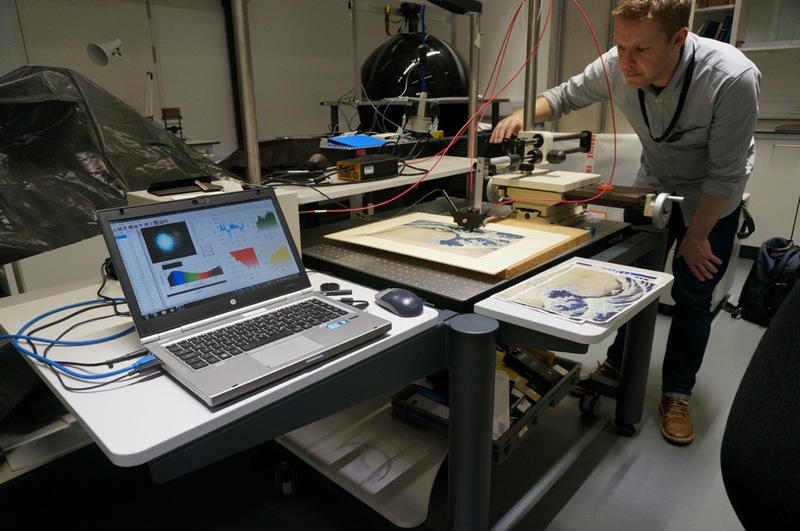 MSI involves exposing an object to different types of light (infrared, visible and ultraviolet) resulting in different images reflected from the print. Observing whether an ink absorbs or reflects the light gives us clues as to its identity. Combining the infrared or ultraviolet reflected image with the visible reflected image of the object produces a ‘false-colour’ image, which may help to identify the ink used in the print. For instance, in false colour infrared (FCIR) images indigo, a dark blue dye commonly obtained from a tropical plant, appears bright red. Top: Katsushika Hokusai (1760–1849), Clear day with a southern breeze (Red Fuji) from Thirty-Six Views of Mt Fuji. Colour woodblock, 1831. Bottom: FCIR image. The FCIR image of ‘Red Fuji’ is striking. We can clearly see where indigo has been used on the print: the title cartouche, the signature, the outline of Mount Fuji and the tiny trees on the mountain. The blue sky was coloured using a different ink, which contains a large amount of iron. This tells us it is Prussian blue (its common scientific name is ferric ferrocyanide). Prussian blue is the first modern synthetic pigment and it had just been adopted for commercial printing in Japan from China and Europe when Hokusai’s prints were made. Prussian blue was also used on the green area of the mountain, where a yellow pigment, orpiment, was added to Prussian blue to produce the green colour. Orpiment is an arsenic sulphide mineral used as a pigment for centuries. Top: Katsushika Hokusai (1760–1849), Under the Wave off Kanagawa (The Great Wave). Colour woodblock print, c. 1831. Acquired with Art Fund support. Bottom: FCIR image. In ‘The Great Wave’ we clearly see from the FCIR image above that, again, indigo was used to print the outline of the image, the title cartouche and the signature, but also the dark areas on the waves. This is evident from the offset at the bottom left-hand side of the print. Prussian blue was used to print the medium blue of the waves. More tests will be needed to find out which ink was used for the light blue of the waves. Arsenic was detected on some parts of the boats using XRF, which suggests the use of orpiment. Peter McElhinney conducting microfading tests on ‘The Great Wave’. Having gathered information on the inks of these two prints, Peter and I then investigated how light sensitive they are by conducting microfading tests. This technique involves focusing a tiny spot of very bright light (0.3mm wide – the width of a few human hairs) on an area of the print and measuring how much the colour changes using a spectrometer, an instrument which is much more sensitive to colour changes than the human eye. A microfading test is very fast: it usually runs for only 10 minutes. Because the spot of light is so small and the test is stopped immediately if the colour change becomes visible, this technique is completely safe to the print. Microfading is very useful to determine rapidly if an object is light sensitive and the method is used by many museums around the world. Most of the inks are of low or medium light sensitivity in the microfading tests. However, orpiment, the yellow pigment present on both prints, is known to be very light sensitive. For instance, it was used on ancient Egyptian papyri and there are many examples where it has completely faded. 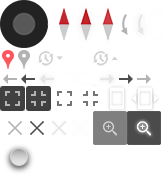 You can see this in the images below. The fading of orpiment is a complex process and unfortunately represents a rare instance where microfading fails to detect its light sensitivity. Sections of Book of the Dead of Ani. The papyrus on the left has been kept in storage while the papyrus on the right was on display for many years. You can see how the horizontal band coloured with orpiment at the top is yellow on the left and colourless on the right. Based on these findings, Peter and I advised that ‘Red Fuji’ and ‘The Great Wave’ should not be on display for more than 20% of the time and exposed to only dim light (no more than 50 lux, which is the minimal amount of light required to view any object). This means that if these prints are displayed for three months at 50 lux, they should be stored in the dark for at least a year before they are displayed again. While these measures will not stop fading from occurring altogether, they will ensure that these world-famous prints fade so slowly that they will be seen by countless generations of visitors to the Museum in the future. Hokusai: beyond the Great Wave is on display at the Museum from 25 May to 13 August 2017 (closed 3–6 July for conservation reasons), supported by Mitsubishi Corporation.